Hot Wheels: Pedal to the Metal! 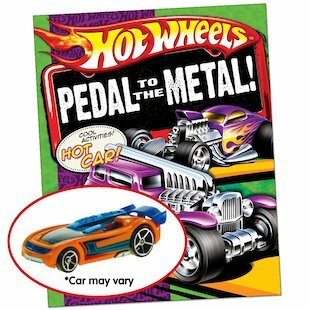 Slam your foot down to the metal and make the track sizzle with the latest cool book from the world’s hottest garage – plus the latest awesome model car! Puzzles, games, activities, quizzes, races, custom colouring and all the raddest cars from right across the globe. Build up your Hot Wheels knowledge until you’re a true pro! A fantastic activity book with a model car. Car colours and styles may vary.